HOKIES PREPARE TO FIGHT CANCER Though Relay For Life is a single night of fundraising and fun for most Hokies, there’s a lot that happens behind the scenes. The Survivor Lap starts off Relay For Life, April 24, 2015. MEET THE STAFF! Editor in chief Jessica Brady discusses her favorite chip flavor. included a resolution to transfer $65,000 from the Stormwater Quality Improvement Project to the VDOT 2019 Revenue Sha r i ng-Hem lo ck a nd Church Street Stormwater Improvements Project. This resolution is intended to improve the public storm drainage system and direct stormwater away from an existing residential apartment complex. The residential apartment complex has several issues a year in regards to stormwater related damages, and the movement of these already appointed funds are critical to fund the improvements to the Hemlock and Church Street project. Next, an amendment was made to a contract with EEE Consulting, Inc. to incorporate more services in regards to environmental assessment and remediation. A public hearing is scheduled for April 23 for an interim agreement about a Public Safety Complex and how it relates to the town’s Public-Private Education Facilities and Infrastructure Act of 2002 guidelines. Another public hearing is scheduled for May 14 regarding the development of a Freedom First Credit Union building on Prices Fork Road and for an ordinance to rezone a residential area on South Main Street to a Downtown Commercial and Planned Residential Zoning. There will also be a hearing that day to approve an agreement for the redevelopment of the old Blacksburg Middle School site and to allow the development of parking spaces there. recognize the flaws in the current system and be prepared to stand up for human rights. not provide all of the funding for a film but being given the final approval of a script is a powerful tool for spreading a message across the U.S. and even the world. I recognize that it is folly to attempt to persuade the Pentagon to put its money to use elsewhere. After all, it is getting what it wants: a public that is generally very supportive of the military. It is the most trusted institution in the U.S., with 74 percent support as of July 2018 — higher than small businesses at 67 percent and the police at 54 percent, the only other institutions with support from a majority of Americans. Like to Go to War,” Karl Marlantes describes an experience during his time serving in Vietnam in which he killed an enemy soldier who was trying to surrender. He writes about how hard it was to admit to himself that he committed a war crime, how he chose to forget rather than confront the truth. Does Marlantes deserve to be imprisoned over this crime? I don’t believe so, but I understand people who would wish to punish him to the fullest extent of the law. Hearing about more experiences like Marlantes’ is essential to understanding the dichotomy between the soldiers of stories and in reality. The Pentagon may try to suppress these stories but it is incumbent upon American citizens to seek them out regardless. We cannot afford to be uncritical of the military. We must be willing to recognize the flaws in the current system and be prepared to stand up for human rights. We have to look beyond what we want to see in order to truly grasp the truth. Voice your opinion. Send letters to the Collegiate Times. All letters must include a name and phone number. Students 365 Squires Student Center must include year and major. Faculty and staff must include Blacksburg, VA, 24061 position and department. 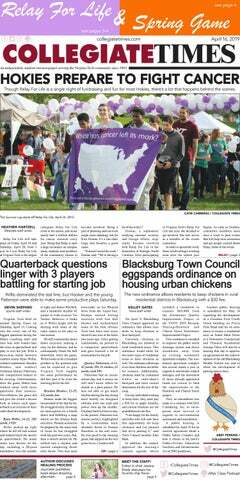 Other submissions must include city of residence and relationship to Virginia Tech (i.e., alumni, opinionseditor@collegiatetimes.com parent, etc.). We reserve the right to edit for any reason. Anonymous letters will not be printed. Letters, commentaries and editorial cartoons do not reflect the views of the Collegiate Times. Editorials are written by the Collegiate Times editorial board, which is composed of the opinions editors, editor in chief and managing editors. this is an opportunity that Virginia Tech will take. LUIS SINCO / LOS ANGELES TIMES Offshore oil drilling platforms along the California coastline in Huntington Beach on Jan. 5, 2018. President Trump is laying the groundwork to limit states’ say in offshore drilling plans. The Collegiate Times, a division of the Educational Media Company at Virginia Tech, was established in 1903 by and for the students of Virginia Polytechnic Institute and State University. 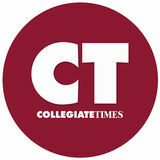 The Collegiate Times is published every Tuesday of the academic year except during exams and vacations. To order a reprint of a photograph printed in the Collegiate Times, visit reprints.collegemedia.com. The Collegiate Times is a division of the Educational Media Company at Virginia Tech, Inc., a 501(c)3 nonprofit with a mission to provide educational experience in business and production of mass media for Virginia Tech students. © Collegiate Times, 2019. All rights reserved. Material published in the Collegiate Times is the property thereof, and may not be reprinted without the express written consent of the Collegiate Times. ‘Cancer changes more than just a single person — it changes families.’ Our writer Relays with the hope that the words “You have cancer” will one day cease to be spoken. an impact on my life; I had three other grandparents filling the void whom I loved dearly. Still, the summer after my freshman year of high school, things took a turn for the worst. We had just traveled through some of the most beautiful places in southern India, my three grandparents, my younger sister and I. Shortly after we arrived back at my grandparents’ home in Vijayawada, Andhra Pradesh, India, my grandfather started complaining of stomach pain. Naturally, he assumed it was just a stomachache. It did not go away for several days, so my mother, a physician, took him to the doctor’s office. At first, the doctor thought it was kidney stone or gallstones, but soon the devastating diagnosis came in. It was liver cancer. What Relay For Life should do to help cancer survivors like me Our writer, who won her battle with non-Hodgkin lymphoma, hopes Relay will increase its survivor support in the future. friends’ social media pages with videos of people trying to use cancer and survivorship as an identity. As a cancer survivor, it feels like something I experience everyday. It hurts to see ignorance, so much so that attending would rub salt on my open wound. CAROLINA HERNANDEZ / COLLEGIATE TIMES Cancer survivor Rachel Kiser, April 11, 2019.
fundraising, but loses sight of the people who fight even after remission. Make Relay more like Big Event –– send teams to visit patients, organize safe events for patients to attend, like a prom, make gift baskets. Make it less about the event, more about the people and the impact you personally make. But, instead of completely getting rid of the longstanding Virginia Tech tradition, let’s reinvent it with more survivor’s experience, more education of cancer after remission and more emphasis on c om mu n it y out r e a ch. Cancer will most likely never leave our lives, and it’s something I will carry in mine forever. It’s okay to stand together, break down the walls and let others hear what we have to say. Relay rocks the house: Get to know this year’s performing artists Here’s the low-down on the diverse musical talent that will soundtrack this year’s Relay For Life. ANTHONY WU / COLLEGIATE TIMES The Band Concord takes the stage to perform for everyone at Relay For Life, April 20, 2018.
and thousands of people gathered together, Relay For Life will be an amazing night. If you are still interested in participating in Relay For Life, you can find information about the event through the website and Facebook. 18 years of fighting for a cure: The history of Relay at Tech Relay For Life was founded in 1985, and first took place on Virginia Tech’s campus in 2001.
money for cancer. Since 1996, Relay For Life has spread internationally, and Global Relay for Life events are being held in 26 different countries. This organization unifies communities across the globe who are determined to participate in the battle against cancer. Additionally, hundreds of high schools and college campuses across the nation participate in Relay For Life. Virginia Tech is one of those schools. This community-wide movement began in 2001, and follows the school’s motto, “Ut Prosim,” That I May Serve. Relay For Life is Virginia Tech’s way of honoring those who have won their battle against cancer and work towards finding a cure. In 2009, Virginia Tech earned recognition as the number one collegiate Relay For Life and one of the largest global Relay For Life events, a status it holds to this day. Every April for the past 18 years , Tech has held a 12-hour event on the Drillfield, open to past and current Hokies as well as family and friends as a way of celebrating the year-long fundraising efforts of the school. T here a re sever a l teams that participate in Relay For Life every year. Traditionally, the night is filled with a plethora of activities, programs and booths set up by various organizations at Tech. It is also a night to remember those who fought the battle against cancer, both survivors and victims, through events like the The Survivor Lap, Survivor’s Banquet and Luminaria Ceremony. Of course, Relay For Life goes beyond a single night in April. There are also several pre-fundraising events that occur prior to the official event including bake sales, car washes and percentage nights. This year, Virginia Tech had a percentage night at Moe’s on Friday, April 12. In addition, much of the fundraising occurs through social media. Since its establishment, Virginia Tech Relay For Life has raised more than $5 million dollars, all of which goes toward supporting cancer research Over the last 10 years, Virginia Tech has raised half a million dollars every year. President Sands: Thank you for the VetZone space! ANTHONY WU / COLLEGIATE TIMES The Survivor Lap kicks off to celebrate those who have successfully fought back against cancer, April 20, 2018. – Veterans@VT National Register of Historic Places will be affected by the project. In compliance with the National Historic Preservation Act, Section 106 and 36 Student Veterans of Give yourCFR Part 800, public participation requested to determine if properties listed written or oral comments at theismeeting or submit them by May 2, 2019, to Tim or eligible for listing inHarrison the National Register of Historic Places will be affected by Dowdy, Project Manager, 731 Avenue, Salem, VA 24153. Comments also can be America (SVA) thetim.dowdy@vdot.virginia.gov. project. emailed to Please reference “Western Perimeter Road Public Lounge located at GBJ room 300 – above Seattle’s Best Coffee Find SVA on GobblerConnect! Comment” in the subject heading. Give your written or oral comments at the meeting or submit them by May 2, 2019, to Tim Dowdy, Project 731 Harrison Salem, VA 24153. VDOT ensures nondiscrimination and Manager, equal employment in allAvenue, programs and activities in Comments canTitle be emailed to Civil tim.dowdy@vdot.virginia.gov. accordance with Titlealso VI and VII of the Rights Act of 1964. If youPlease need more information in regards to yourPerimeter civil rightsRoad on this project or need in special assistance for reference “Western Public Comment” the subject heading. persons with disabilities or limited English proficiency, contact Tim Dowdy at the phone VDOT ensures nondiscrimination and equal employment in all programs and numbers listed above. activities in accordance with Title VI and Title VII of the Civil Rights Act of 1964. If you need more information in regards to your civil rights on this project or need State Project: 0314-060-R32, P-101 UPC: 108871 special assistance for persons with disabilities or limited English proficiency, contact Tim Dowdy at the phone numbers listed above. really delicious sandwich that I like a lot: The Good Egg. It’s really good. And I like to get a nice tall cup of ice water. What’s your favorite chip flavor and why? I like the Sour Cream and Onion Lay’s. Those are freaking delicious. I also like Ruffles, Cheetos, I like all chips. Cardi B or Nicki Minaj? Nicki Minaj, definitely. Plus, Saj, the design editor, has some resemblance to Nicki Minaj. I gotta be loyal. What have been binge watching lately? I just finished what is out so far of “The Act.” It was really really good. Today’s Birthday Horoscope (April 16): Raise your skills and expertise through travel and education this year. Dedicated focus builds your career status and influence. Domestic joys delight your family this summer, inspiring new professional directions. Your work and career flourish next winter, inspiring changes at home. Develop an exciting possibility. dication on who will get the nod week one against Boston College. paramount in determining Virginia Tech’s success this upcoming season. ” Did the Hokies make the grade in Spring Game? out of the pocket showing the right instincts and decisions. The biggest concern will be replacing Ricky Walker in the trenches. Grade: ALinebackers The linebackers did their jobs Saturday, attacking the ball and minimizing gains by the offense. There were few passes over the middle that were not batted down or tackled immediately. Rising sophomore Dax Hollifield will be a standout at the linebacker position this coming season. Grade: B+ Defensive backs The defensive backs started strong by locking up the receivers and allowing few receptions past the linebackers. The secondary played great coverage throughout most of the game, sliding when necessary and closing on throws and runs efficiently. The team had one interception, lots of defensive stops, kept the receivers on the outside with throws, and had very few slip-ups for large gains. CAROLINA HERNANDEZ / COLLEGIATE TIMES James Mitchell (82) pushes through the defense, Lane Stadium, April 13, 2019.
nice throws and broke off several big runs. Patterson did well in improving his chances to be named starter next season. The biggest defensive standout was Emmanuel Belmar. Belmar was all over the field and even got to Willis and sacked him. Hokies fans will likely see more of Belmar than last season due to a season-ending knee injury that Houshun Gaines suffered last year against Pittsburgh. A lot of questions will arise from now until September; the offense has a lot of depth, and players at all positions got many reps as the game went along. Though it was just a practice game, the reps were crucial to seeing next year’s team will look like and how they progressed from last year’s 6–7 record. “We still have many challenges in front of us. I’m excited to be out there with these guys,” said Fuente. After being selected 33rd by the Connecticut Sun in the 2019 WNBA draft, Virginia Tech redshirt senior standout Regan Magarity becomes just the fifth Hokie to be drafted into the WNBA and first since Nare Diawara was taken 34th overall by the San Antonio Stars in 2007. “I am extremely happy for Regan on her being selected by the Connecticut Suns in the 2019 WNBA draft,” said Virginia Tech head coach Kenny Brooks. “Her hard work and dedication to our program has paid off with this accomplishment. She is most deserving of this honor and I know she will do well. Connecticut is lucky to have her as Hokie Nation was. ANTHONY WU / COLLEGIATE TIMES Regan Magarity (11) waits to pass the ball in the Hokies’ 67–51 win over the Scarlet Knights, Nov. 28, 2018.
points and an ACC-best 12.8 rebounds while leading the Hokies to a 22-12 record. Virginia Tech has seen some of the most success it has had in recent memory with Magarity on the team. Over the past three seasons, the Hokies went 20-14, 23-14 and 22-12 as the Swedish sensation aided Virginia Tech head coach Kenny Brooks, Taylor Emery and the crew to some of its best seasons since the late 1990s and early 2000s when the Hokies won 20 or more games for seven straight seasons under Boonie Henrikson. Virginia Tech’s all-time rebounding leader joins 6-foot-4 Cal center Kristine Anigwe, the Naism ith Defensive Player of the Year, and Marquette’s Natisha Hiedeman, the Big East Player of the Year, with Connecticut, shoring up the Sun’s frontcourt and adding a dynamic guard to the backcourt. Along with Anigwe and Hiedeman, Magarity looks to help propel Connecticut to its third conference title and its first league championship. Last year, the Sun lost in the second round of the playoffs to the Phoenix Mercury for a second straight season, finishing 21-13, the same record as the previous season. Below are the names of the 32 victims who died on April 16, 2007. Virginia Tech alumni share their tattoos in remembrance of the victims who passed away in the April 16 shooting. pretty new to the area when it happened. I was in the golf business at the time, though I started teaching high school math the following school year (which is what I still do). Each year, I talk to my classes about 4/16. I got this tattoo just above my left ankle in the spring of 2008,” Hamric, a Class of 1992 alumnus, said. COURTESY OF JACOB HILTON “My name is Jacob Hilton, a 2008 grad in civil engineering. Two of those lost on April 16 were a professor and a lab TA of mine at the time. I got my ‘Ut Prosim’ tattoo as a daily reminder to serve others in memory of the 32 Hokies who no longer had the opportunity to live out that motto,” Hilton said. “I graduated in 2009, (and I) was next door in McBryde 100. Those are the coordinates of Blacksburg, and there’s definitely a story behind that,” Baggerly said. COURTESY OF NICHOLE KROL “I graduated in May 2007 shortly after the shootings when our lives as college students were forever changed. I got this tattoo to remember the 32 Hokie angels that were lost too soon on that tragic day on our beloved campus. neVer forgeT,” Krol said. ALEXA JOHNSON / COLLEGIATE TIMES A reminder of Hokie strength sits next to the April 16 Memorial. with the people he was interviewing and conducted multiple interviews over the course of several years. According to him, he was able to go more in-depth as the interviews went on, but still tried to be respectful. “I was asked at a panel about the book whether I thought about this book as news or whether I thought this book was history,” Kapsidelis said. “I said I think it’s a bit of both, because 10 years is not a great deal of time. It’s still the beginning for a lot of people.” The book will be released on April 16 of this year and can be purchased for $29.95 from the University of Virginia Press website.